250 UPrinting Business Cards Giveaway! Perfect for Moms & Bloggers Alike! As a blogger, having business cards for my blog is a basic necessity. I pass them out at conferences, local businesses, etc. I even include a few with my giveaway prizes for my readers to pass along to any friends that might be interested. Business cards are by far the easiest way to get your info out there. One card can hold so much info, such as your contact, social media, blog info and more. With all that being said, business cards can be used by anyone, not just bloggers or business owners. They work great as mom business cards. 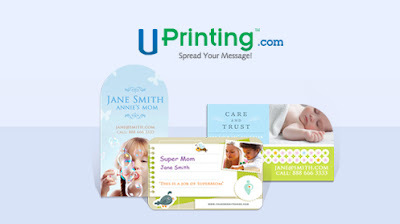 UPrinting business cards are completely customizable, made by you. A great idea would be to add an image of your child with emergency contact info on it to hand out to babysitters. Does your child have any allergies? You can add that important info on the card as well. Here's a few other ideas: name/gift tags, thank you notes, and place cards, just to name a few. UPrinting offers affordable business cards in several different shapes and sizes. You can create your card from scratch or use one of their many templates to help you out a little bit. The prices are very reasonable, but the quality is excellent! Thanks to UPrinting, two lucky readers will win 250 die-cut business cards! You can choose from the following shapes/sizes: 2×3.5″ Rounded Corners, 2×2″ Rounded Corners, 1.75×3.5″ Rounded Corners, 2×3.5″ Leaf, 2×3.5 Rounded one corner, 2×3.5″ Half-Circle Side, 2×3.5″ Oval, or 2.5″ Circle and the following paper quality: 14pt Cardstock Gloss / Matte / High Gloss (UV), or 13pt Cardstock Uncoated. The cards have a 6 business days print turnaround time and will ship for free in the U.S. only. This giveaway is open to US residents only, 18 years old and above. Winners are allowed to win once over a six-month period. Only email addresses used for the giveaway will be eligible to claim the prize. All entries in the giveaway are optional...complete as few or as many as you like! GOOD LUCK! I would use them for my blog! I'd use them to get the word out about the bakery my family's opening at the end of summer! I would use the cards to promote my newest etsy store! I'd use them for Mommy calling cards. I would use them for my blog. I would use them for my new ItWorks business!!!! I'd use them for my photography business! I would use them for my in-home childcare services. I'd use it for either promoting my blogs or my web design business. Its a tough choice! Thanks for the giveaway! I wish I could tell which date you posted this blog I'm posting a comment on because I'd be really interested to be part of this. These business cards are really awesome..keep it up.!!!!!! Nice business cards. Fantastic design.